The Paris–Roubaix is a one-day professional men's bicycle road race in northern France, starting north of Paris and finishing in Roubaix, at the border with Belgium. It is one of cycling's oldest races, and is one of the 'Monuments' or classics of the European calendar, and contributes points towards the UCI World Ranking. The most recent edition was held on 14 April 2019. Paris–Roubaix is one of the oldest races of professional road cycling. It was first run in 1896 and has stopped only for the two world wars. 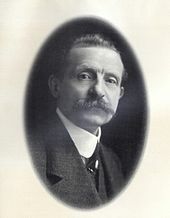 The race was created by two Roubaix textile manufacturers, Théodore Vienne (born 28 July 1864) and Maurice Perez. They had been behind the building of a velodrome on 46,000 square metres at the corner of the rue Verte and the route d'Hempempont, which opened on 9 June 1895. Vienne and Perez held several meetings on the track, one including the first appearance in France by the American sprinter Major Taylor, and then looked for further ideas. In February 1896 they hit on the idea of holding a race from Paris to their track. This presented two problems. The first was that the biggest races started or ended in Paris and that Roubaix might be too provincial a destination. The second was that they could organize the start or finish but not both. Dear M. Rousseau, Bordeaux–Paris is approaching and this great annual event which has done so much to promote cycling has given us an idea. What would you think of a training race which preceded Bordeaux–Paris by four weeks? The distance between Paris and Roubaix is roughly 280km, so it would be child's play for the future participants of Bordeaux–Paris. 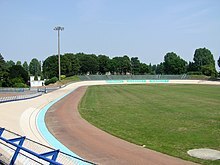 The finish would take place at the Roubaix vélodrome after several laps of the track. Everyone would be assured of an enthusiastic welcome as most of our citizens have never had the privilege of seeing the spectacle of a major road race and we count on enough friends to believe that Roubaix is truly a hospitable town. As prizes we already have subscribed to a first prize of 1,000 francs in the name of the Roubaix velodrome and we will be busy establishing a generous prize list which will be to the satisfaction of all. But for the moment, can we count on the patronage of Le Vélo and on your support for organising the start? The proposed first prize represented seven months' wages for a miner at the time. Rousseau was enthusiastic and sent his cycling editor, Victor Breyer, to find a route. Breyer travelled to Amiens in a Panhard driven by his colleague, Paul Meyan. The following morning Breyer — later deputy organiser of the Tour de France and a leading official of the Union Cycliste Internationale - continued by bike. The wind blew, the rain fell and the temperature dropped. Breyer reached Roubaix filthy and exhausted after a day of riding on cobbles (setts). He swore he would send a telegram to Minart urging him to drop the idea, saying it was dangerous to send a race the way he had just ridden. But that evening a meal and drinks with the team from Roubaix changed his mind. Vienne and Perez scheduled their race for Easter Sunday. The Roman Catholic Church objected to it being held on the most sacred day of the liturgical year, suggesting that riders would not have time to attend mass and that spectators might not bother to attend either. [n 2] Tracts were distributed in Roubaix decrying the venture. What happened next is uncertain. Legend says that Vienne and Perez promised a mass would be said for the riders in a chapel 200m from the start, in the boulevard Maillot. This story is repeated by Pascal Sergent, the historian of the race, and by Pierre Chany, historian of the sport in general. Sergent goes as far as saying that Victor Breyer, who he says was there, said the service, scheduled for 4 am, was cancelled because it was too early. Neither Chany nor Sergent mentions if the date of the race was subsequently changed, however the first Paris–Roubaix (according to Sergent) was held on 19 April 1896, whereas Easter Sunday in 1896 occurred two weeks earlier, on the 5 April. The first Paris–Roubaix on Easter Sunday was the next year, 1897. Josef Fischer won the first edition of Paris–Roubaix. News of Breyer's ride to Roubaix may have spread. Half those who entered did not turn up at the Brassérie de l'Espérance, the race headquarters at the start. Those who dropped out before the race began included Henri Desgrange, a prominent track rider who went on to organize the Tour de France. The starters did include Maurice Garin, who went on to win Desgrange's first Tour and was the local hope in Roubaix because he and two brothers had opened a cycle shop in the boulevard de Paris the previous year. Garin came third, 15 minutes behind Josef Fischer, the only German to have won the race until 2015. Only four finished within an hour of the winner. Garin would have come second had he not been knocked over by a crash between two tandems, one of them ridden by his pacers. Garin "finished exhausted and Dr Butrille was obliged to attend the man who had been run over by two machines," said Sergent. As the two champions appeared they were greeted by a frenzy of excitement and everyone was on their feet to acclaim the two heroes. It was difficult to recognise them. Garin was first, followed by the mud-soaked figure of Cordang. Suddenly, to the stupefaction of everyone, Cordang slipped and fell on the velodrome's cement surface. Garin could not believe his luck. By the time Cordang was back on his bike, he had lost 100 metres. There remained six laps to cover. Two miserable kilometres in which to catch Garin. The crowd held its breath as they watched the incredible pursuit match. The bell rang out. One lap, there remained one lap. 333 metres for Garin, who had a lead of 30 metres on the Batave. A classic victory was within his grasp but he could almost feel his adversary's breath on his neck. Somehow Garin held on to his lead of two metres, two little metres for a legendary victory. The stands exploded and the ovation united the two men. Garin exulted under the cheers of the crowd. Cordang cried bitter tears of disappointment. This wasn't a race. It was a pilgrimage. —  Henri Pélissier, speaking of his 1919 victory. Alain Bernard, President of 'Les Amis de Paris Roubaix': "These days the mayors come to me with cobbles." After the war, of course, the roads were all bad. There were cobbles from the moment you left Paris, or Senlis where we started in those days. There'd be stretches of surfaced roads and often there'd be a cycle path or a pavement and sometimes a thin stretch of something smoother. But you never knew where was best to ride and you were for ever switching about. You could jump your bike up on to a pavement but that got harder the more tired you got. Then you'd get your front wheel up but not your back wheel. That happened to me. And then you'd go sprawling, of course, and you could bring other riders down. Or they'd fall off and bring you down with them. And the cycle paths were often just compressed cinders, which got soft in the rain and got churned up by so many riders using them and then you got stuck and you lost your balance. And come what may, you got covered in coal dust and other muck. No, it's all changed and you can't compare then and now. Until the war, Paris–Roubaix was all on routes nationales. 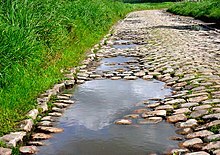 But many of those were cobbled, which was the spirit of the race, and the riders used to try to ride the cycle paths, if there were any. So Paris–Roubaix has always been on pavé, because pavé was what the roads were made of. Then in 1967 things began to change. There was less pavé than there had been. And so from 1967 the course started moving to the east to use the cobbles that remained there. And then those cobbles began to disappear as well and we feared that Bouvet's predictions were going to come true. That's when we started going out looking for old tracks and abandoned roads that didn't show up on our maps. In the 1970s, the race only had to go through a village for the mayor to order the road to be surfaced. Pierre Mauroy, when he was mayor of Lille, said he wanted nothing to do with the race and that he'd do nothing to help it. A few years ago, there was barely a village or an area that wanted anything to do with us. If Paris–Roubaix came their way, they felt they were shamed because we were exposing their bad roads. They went out and surfaced them, did all they could to obstruct us. Now they can't get enough of us. I have mayors ringing me to say they've found another stretch of cobbles and would we like to use them. —  Alain Bernard, President of 'Les Amis de Paris-Roubaix', 2007. Until then, it [the bar ('Cafe de l'Arbre')] was open only one day a year. In France, a bar has to open one day a year to keep its licence. That's all it did, because it's out in the middle of nowhere and nobody went there to drink any more. With the fame that the race brought it, it's now open all year and a busy restaurant as well. The trouble is that the Belgians then come out to see the race and they pull up a cobble stone each and take it home as a souvenir. They've even gone off with the milestones. It's a real headache. But I'm confident now that Paris–Roubaix is safe, that it will always be the race it has always been. The strategic places where earlier races could be won or lost include Doullens Hill, Arras, Carvin and the Wattignies bend. Some sections of cobbles have deteriorated beyond the point of safety and repair or have been resurfaced and lost their significance. Other sections are excluded because the route of the race has moved east. Originally, the race was from Paris to Roubaix, but in 1966 the start moved to Chantilly, 50 km north, then in 1977 to Compiègne, 80 km north. From Compiègne it now follows a 260 km winding route north to Roubaix, hitting the first cobbles after 100 km. 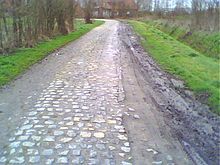 During the last 150 km the cobbles extend more than 50 km. The race culminates with 750m on the smooth concrete of the large outdoor Vélodrome André-Pétrieux in Roubaix. The route is adjusted from year to year as older roads are resurfaced and the organisers seek more cobbles to maintain the character of the race — in 2005, for example, the race included 54.7 km of cobbles. The organisers grade the cobbles by length, irregularity, the general condition and their position in the race. This sector is now usually the first cobbled section, typically about 100 km into the race, and was first used 1987. It is the highest of all the cobbles at 136 m.
A 2.5 km sector named after Bernard Hinault, the 1981 winner, which also features frequently in the Quatre Jours de Dunkerque race. It starts at 31m and finishes at 34m. It begins with a gentle rise and finishes with a gentle fall. Trouee d'Arenberg - 2008 Paris–Roubaix. A memorial to Stablinski stands at one end of the road. It's the true definition of hell. It's very dangerous, especially in the first kilometre when we enter it at more than 60kh. It's unbelievable. The bike goes in all directions. It will be a real spectacle but I don't know if it's really necessary to impose it on us. What I went through, only I will ever know. My knee cap completely turned to the right, a ball of blood forming on my leg and the bone that broke, without being able to move my body. And the pain, a pain that I wouldn't wish on anyone. The surgeon placed a big support [un gros matériel] in my leg, because the bone had moved so much. Breaking a femur is always serious in itself but an open break in an athlete of high level going flat out, that tears the muscles. At 180 beats [a minute of the heart], there was a colossal amount of blood being pumped, which meant my leg was full of blood. I'm just grateful that the artery was untouched. Gaumont spent a month and a half in bed, unable to move, and was fitted with a 40 mm section fixed just above the knee and, to the head of the femur, with a 12 mm screw. So many fans have taken away cobbles as souvenirs that the Amis de Paris–Roubaix have had to replace them. The second of three sectors usually graded as five star difficulty, this 3 km sector includes a 16m rise and 2 right-angled turns. It was first used in 1978 and, as of 2016, has been used every year since except 2001. 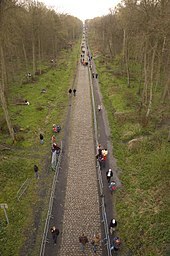 Le Carrefour de l'Arbre (or Pavé de Luchin) is the last section of pavé of the hardest level of difficulty, five stars. The crossroads (carrefour) is on open land between Gruson and Camphin-en-Pévèle. The route departs westward from Camphin-en-Pévèle along the rue de Cysoing towards Camphin de l'Arbre. The first half is a series of corners, then along irregular pavé towards Luchin. The second half finishes at the Café de l'Arbre restaurant and has more even pavé. This 2.1 km sector has often proved decisive due to its proximity to Roubaix (15 km) and cumulative difficulty. 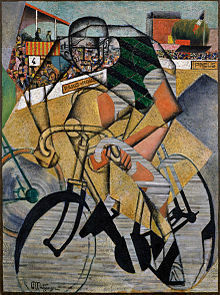 Jean Metzinger, 1912, At the Cycle-Race Track (Au Vélodrome), oil and sand on canvas, 130.4 x 97.1 cm, Peggy Guggenheim Collection. This painting illustrates the final meters of the Paris–Roubaix race, and portrays its 1912 winner Charles Crupelandt. The final stretch of cobbles before the stadium is named after a local rider, Charles Crupelandt, who won in 1912 and 1914. 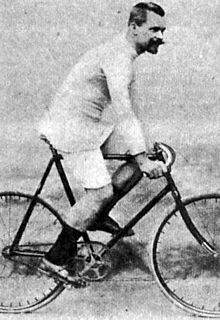 The organiser of the Tour de France, Henri Desgrange, predicted he would win his race. Crupelandt then went to war and returned a hero, with the Croix de Guerre. This 300 m sector was created for the centenary event in 1996 by laying a strip of smooth new cobbles down the centre of a wide street. Among the cobbles are plaques to every race winner, giving the road an official name of 'Chemin des Géants,' [Road of the Giants]. The race moved to the current stadium in 1943, and there it has stayed with the exceptions of 1986, 1987 and 1988 when the finish was in the avenue des Nations-Unies, outside the offices of La Redoute, the mail-order company which sponsored the race. The shower room inside the velodrome is distinctive for the open, three-sided, low-walled concrete stalls, each with a brass plaque to commemorate a winner. These include Peter Van Petegem, Eddy Merckx, Roger De Vlaeminck, Rik Van Looy and Fausto Coppi. When I stand in the showers in Roubaix, I actually start the preparation for next year. A commemorative plaque at 37 avenue Gustave Delory honours Émile Masson Jr., the last to win there. Paris–Roubaix presents a technical challenge to riders, team personnel, and equipment. Special frames and wheels are often used. In the past, developments to cope with the demands of Paris–Roubaix have included the use of wider tires, cantilever brakes, and dual brake levers. More recently, manufacturers such as Specialized have developed new types of bike which are designed to cope with the demands on the cobbled classics: the best known being the Specialized Roubaix series, which has a longer wheelbase and is designed to offer the rider a more forgiving ride. Many teams disperse personnel along the course with spare wheels, equipment and bicycles to help in locations not accessible to the team car. Riders have experimented, however. After the Second World War many tried wooden rims of the sort used at the start of cycle racing. Francesco Moser wrapped his handlebars with strips of foam in the 1970s. Gilbert Duclos-Lassalle and Greg LeMond experimented with suspension in their front forks in the 1990s. Some top riders receive special frames to give more stability and comfort. Different materials make the ride more comfortable. Tom Boonen, using a Time frame with longer wheelbase for the first time, won the race in 2005 and has since continued to use a bike with a longer wheelbase. George Hincapie had a frame featuring a 2 mm elastomer insert at the top of the seat stays. The manufacturers claimed this took nearly all the shock out of the cobbles. Hincapie's Trek bicycle fared less well in 2006: his aluminum steerer tube snapped with 46 km to go, the crash injuring his shoulder. Canadian rider Steve Bauer had a frame built by Eddy Merckx Bicycles with extremely slack angles, to the extent of being semi-recumbent. It was not a success and was only used for one edition of the race. The bicycle made for Peter Van Petegem in 2004 was a Time. The distance from bottom bracket to rear axle was 419 mm rather than his normal 403. The distance from the bottom bracket to the front hub was 605 mm instead of 600 mm. The depth of the front forks was 372 mm instead of 367.5 mm The forks were spaced to take 28 mm tyres. The sprockets were steel rather than alloy and the steerer column was cut 5 mm higher than usual to raise the handlebars if needed before the start. Every year we change fewer wheels, because the wheels and tyres are getting better and better. We changed about 20 wheels today. Five years ago, it was much worse — we'd be choosing about a hundred. Tyres are becoming much better than before. So, yes, our job is easier — except that the race generally goes faster now, so we're under a bit more pressure. Every year, there's new types of gears, new aluminium frames, new titanium frames, so it's getting more complex for us to offer neutral service. We have a list in the car of who is riding Mavic or Shimano or Campagnolo; the moment someone gets a flat tyre we need to think of a lot of things at once. Is it a titanium frame or a carbon frame or a steel frame? In 1907, Georges Passerieu broke away from a small leading group just before Douai because he knew he couldn't outsprint them if they all finished together. He was chased all the way to Roubaix by a Belgian, Cyrille van Hauwaert, and tension in the velodrome was high. The crowd heard that Passerieu had reached the stadium but nobody rode on to the track. The leader was just about to ride in when a gendarme stepped into his path to check if his bicycle had the obligatory tax plate attached to it. Passerieu had already had a hard day and a shouting match broke out before he was allowed to continue. In 1930, Jean Maréchal finished 24 seconds ahead of Belgian Julien Vervaecke but was moved to second because, while Maréchal was trying to pass Vervaecke, the Belgian tumbled into a ditch. According to some, Maréchal hit the Belgian's shoulder, causing his fall. Jacques Augendre, historian of the Tour de France, said Maréchal, who was 20, "was riding as an individual for a little bike-maker, Colin, and he got to Roubaix alone. His happiness was short-lived. Arbitrarily accused of having provoked a fall by Julien Vervaecke, with whom he had broken away, he was disqualified without any sort of hearing. Important detail: Vervaecke belonged to the all-powerful Alcyon team, run by the no less powerful Ludovic Feuillet..."
In 1934 Roger Lapébie was disqualified for changing bicycles. Second placed rider Gaston Rebry was awarded the victory once officials discovered that Lapébie's bike was missing a race sticker. In 1936 the Belgian, Romain Maes, appeared to win but judges declared Frenchman Georges Speicher the winner and Maes second. Shouting began in the stands and for a moment it looked as though fighting would start, but calm returned and the result was upheld. A Belgian may not have won but there were seven Belgians in the first ten. C'est trop bête d'en parler (It's too stupid to talk about). There was a break. Coppi attacked. His brother Fausto gave him a push to get him away. He wanted his brother to win. I waited a bit and then I attacked and I caught him and the break. Then I went off by myself. I was going to win Paris–Roubaix. At the entrance to the vélodrome, there were crowds everywhere, blocking the way. I looked around for where to go and I was directed round the outside wall of the track, to where the team cars had to park. It wasn't like nowadays, when there's television and everything. Then it was more chaotic and the whole road was blocked. People said I should have known the way into the track. But how do you know a thing like that at the end of Paris–Roubaix, when you've raced all day over roads like that? A gendarme signalled the way to go and that's the way I went. It was a journalist on a motorbike who managed to get up to me. He was shouting 'Not that way! Not that way!' And I turned round in the road and I rode back beneath the outside wall of the grandstand and I saw a gateway that went into the track, a gateway for journalists. And that's the way I went, except that it came out on the other side of the track from the proper entrance. The bunch came in and Serse won the sprint. But then his brother told Serse to go to the judges to object. He told Serse that I hadn't ridden the entire and precise course and that therefore I should be déclassé. But that was below him. Coppi wanted his brother to have a big victory. He was a great champion, Coppi, but to do what he did, to protest like that to get a victory for his brother, that wasn't dignified for a champion. That was below him. A champion like that should never have stooped that low. I never spoke to him about it. Never did. Why should I? The only other times he rode it were in 1980, when he finished fourth, and in 1982, as the defending champion. When he was criticised, he said: "I don't go into offices and tell people to work harder, yet people ask me to be the strongest on the cobbles." Hinault fell seven times in that race, including 13 km from the finish when a small black dog called Gruson ran out in a bend and ran under his wheel. Hinault had been clear with Roger De Vlaeminck, Hennie Kuiper and Marc Demeyer. The incident made Hinault angry and he raced back to the others and won in Roubaix. He was not the first star to refuse. Jacques Anquetil called it a lottery after puncturing 13 km from the end in 1958 and never took it seriously again. We won't go as far as say that the five-time winner of the Tour [Hinault] - who every year gives the winner his celebration cobble stone on behalf of the organisers — has contributed to the dilution [paupérisation] of the queen of classics, which would offend him, but his words have contributed to the snub, or the indifference, of those who stay away. The fact isn't new but the phenomenon is getting worse and is concerning. The peloton of stayaways has grown to the point where Paris–Roubaix is now only for a tight group of specialists... especially the Belgians, capable of maintaining high speed on the cobbles. The 1988 race contained a rare spectacle where an early morning breakaway group held on until the finish: 27 kilometres into the race a group of unknown riders broke away and the pack did nothing to chase them down throughout the race. It was on a section of cobblestones outside Roubaix that Thomas Wegmüller (SUI) and Dirk Demol (BEL) broke away from the lead group to try for the victory. As if the success of the breakaway wasn't enough, Paris–Roubaix was about to deliver a cruel irony. When the two entered Roubaix, Wegmüller ran over a plastic bag that flew out in front of him, which became jammed in his derailleur. Wegmüller was unable to change gears which was crucial for a sprint finish. He got assistance from his team car to remove the bag, but his gears still would not change. Knowing that a bicycle change would be suicidal to his chances, Wegmüller continued on his damaged bike; Demol continued to draft behind him. When it came down to the final sprint, Wegmüller could only watch as Demol sprinted past him to take the victory. Laurent Fignon finished third after a late breakaway from the chasing peloton. In 2006 Leif Hoste, Peter Van Petegem and Vladimir Gusev were disqualified for riding through a closed railway level crossing 10 km before the finish and just ahead of an approaching freight train. Fabian Cancellara won and Tom Boonen and Alessandro Ballan were given the remaining places on the podium. I know the rules, yes, but I don't understand why nobody stopped us, and why nothing was said to us in the 10km that followed. All that just to be told two minutes before going to the podium that we had been disqualified. Cancellara deserved his victory but for me, I will always be in second place even though I have been disqualified. —  Leif Hoste, L'Équipe, April 2006. It's crazy. In Belgium they would have stopped the train. In the 2018 race, Michael Goolaerts (Vérandas Willems–Crelan) crashed after suffering a cardiac arrest 100km into the race. A doctor attempted to resuscitate him on the spot. He was flown to hospital in Lille by helicopter for treatment. At 23:30 local time, his death was announced by his team. "Thousands line the road in this annual rite of spring cheering their larger than life heroes. Urging, at times, even helping them victory. They ride in the tracks of bygone legends dreaming of distant fame and glory. But glory is not without a price. These bloodied and battered warriors struggle through the rain, the cold, the mud, on roads better suited to oxen cart than bicycles. But for the victor there is glory, immortality and a place in history amongst the giants of the road. Since 1896, the greatest bike racers on earth have come to test their very souls in this brutal and beautiful spectacle". "It's a circus, and I don't want to be one of the clowns." - Chris Boardman (speaking before the start on British Eurosport). Les Amis de Paris–Roubaix – the "friends" of the race – is an enthusiasts' group founded by Jean-Claude Vallaeys in 1983. It is based in France but open to members all over the world. 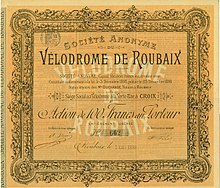 It has its roots in the Paris–Roubaix Cyclo-Touriste of 1972. By 1982 there were 7,242 participants. There and at other events on the course, a petition calling for the cobbles to be saved gathered 10,000 signatures. Jean-Claude Valleys, Jean-François Pescheux[n 6] and the Vélo-club de Roubaix, which Vallaeys founded in 1966, formed Les Amis de Paris–Roubaix in 1982 at a photo exhibition at the Maison du Nord-Pas de Calais[n 7] in Paris. Its aim was to find enough stretches of cobbled road to preserve the nature of the race. So many roads had been resurfaced that, as the organiser said, there was a risk that it would become a fast race on smooth roads won by sprinters rather than those who had fought through hell. Alain Bernard, who succeeded Vallaeys, says: "We have succeeded in that. Today, the association looks after the maintenance of these paths of legend, working with local administrations to preserve them. But alongside that, we also do other things to preserve the value of the race, building up an impressive collection of documents, holding exhibitions, honouring former winners, holding tours of the route." Les Amis says it is too late to save the sector of Bersée, which was removed from the race because of its dangerous state in 2007. The situation is becoming critical, it says, at the Pont Gibus at Wallers, at Mons-en-Pévèle, Pont Thibaut at Ennevelin, the pavé of the Duclos-Lassalle section at Cysoing, and at Camphin-en-Pévèle. "Their disappearance would be a fatal blow to the Queen of Classics," says the association. Saturday 22 March: a cold wind sweeps the plain of Pévèle; alternating showers of hail, melted snow and cold rain. Not a day to venture outside... Nevertheless, at the foot of the Mons-en-Pévèle ridge, silhouettes busy themselves along the soaked cobble roadway. Backs bent against the gusts, they tirelessly scratch at the ground with primitive tools. Who are these dozen souls — A work-gang from a byegone era? Automatons? Treasure-hunters? No, these are members of the "Amis de Paris Roubaix", trying to clean off the mud and crusted earth left on the cobbles by farm work. They are on an important section of Paris–Roubaix and, without their intervention, the greatest of cycling classics, due to be held in only a few days, will not be able to come through... And without these cobbled routes, the Paris–Roubaix would disappear, depriving the whole world of one of sport's most intense and gripping events. This they know, and they'll be back again the two weekends before the race, far from the media and officials who will soon bustle here. The passion that drives them is much stronger than the bad weather. It has nothing to do with the current storms in the cycling world. These discreet servants of the "Queen of the Classics" have only one ambition — to clean the stones so that the when the day comes for the champion to be crowned they can hold their cobbled trophy high. The record held by Peter Post, was set on the pre-1968 course, which contained far fewer cobbles. Oldest winner – Gilbert Duclos-Lassalle, 38 years and 8 months in 1993. Largest winning margin (postwar) – 5 minutes and 21 seconds, when Eddy Merckx beat Roger De Vlaeminck in 1970. Closest margin of victory – 1 cm (0.39 in), between Eddy Planckaert and Steve Bauer in 1990. Slowest victory – 12 hours and 15 minutes, in 1919 when Henri Pélissier won on roads devastated by World War I. Longest victorious break – 222 km (138 mi), by Dirk Demol in 1988. Paris–Roubaix is sometimes compared to the other famous cobbled race, the Tour of Flanders in Belgium. Paris–Roubaix is flatter and has more difficult cobbles while the Tour of Flanders contains a series of hills, many on cobbles, like the Koppenberg or Kapelmuur. In addition to Paris–Roubaix and the Tour of Flanders, called the cobbled classics, other spring races like Omloop Het Nieuwsblad and Gent–Wevelgem feature extensive cobbles. The U23 Paris–Roubaix or Paris–Roubaix Espoirs is raced in the early summer. The Paris–Roubaix Cyclo is organised by the Velo Club de Roubaix every other June. This allows amateurs to experience the cobbles, the finishing laps in the vélodrome, and the showers. There is a choice of three levels: 120 km, most of the cobbled sectors; 190 km all the cobbles; or the full 261 km. All finishers receive a small cobblestone on a wooden plinth. The Paris–Roubaix Skoda Classic Challenge is organised the day before the pro race in April. 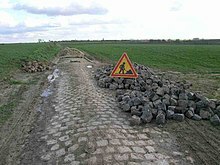 ^ Paris–Roubaix is popularly known throughout the English-speaking world for its 'cobbled sectors', but this is a misnomer as the sectors are actually paved with granite setts, roughly hewn blocks, which are smoother and safer than true cobblestones (prominent rounded pebbles often used on inner city streets). This article maintains the misnomer 'Cobblestones' but attempts to clarify the misnomer where relevant. ^ The Roman Catholic Church objected to the race being run on Easter Sunday, though who and at what level within the Church the objection was made has been lost to history. 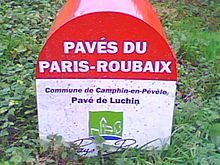 ^ In 2004 Les Amis de Paris-Roubaix marked Garin's victories in the Paris-Roubaix event by placing a cobblestone — traditional trophy for winners of the race, on his grave. See "Hommage à Maurice Garin" (in French). Les Amis de Paris-Roubaix. 3 March 2004. Archived from the original on 12 October 2013. ^ The Bordeaux–Paris race stayed with pacers until 1985. ^ La Maison is a combination of chamber of commerce, lobbying organisation and tourist office. ^ 'Les forçats du pavé' is a reference to a newspaper article and book by Albert Londres which described the toiling riders of the Tour de France as the forçats or forced labourers de la route. ^ Hood, Andrew (6 April 2009). "Racing this week — Of txapelas and pavé". VeloNews. Archived from the original on 10 April 2009. Retrieved 2009-06-23. ^ "Document 2 : Une Course célèbre et légendaire..." Association Généalogique des Familles Vienne. 1 February 2008. Archived from the original on 14 March 2009. ^ Anthony Tan (16 April 2006). "The real Hell of the North". Cyclingnews. Retrieved 5 September 2007. ^ "Easter Dating Method". Astronomical Society of South Australia. April 2002. ^ "Hommage à Maurice Garin" (in French). Les Amis de Paris-Roubaix. 3 March 2004. Archived from the original on 12 October 2013. ^ a b c Les Woodland (6 April 2006). "Tales from the peloton, The real Hell of the North". Cyclingnews. ^ a b "Acceuil". Les Amis de Paris-Roubaix. ^ "History feature". Official Paris-Roubaix site. ^ Ben Atkins (21 June 2006). "Roubaix @ Roubaix — Specializing in cobbles". Cyclingnews. Retrieved 1 September 2007. ^ "Paris-Roubaix 2005". letour.fr. 4 April 2005. Archived from the original on 27 August 2007. Retrieved 2007-09-05. ^ "A New King for the Queen of Classics?". Le Tour de France. 10 April 2007. Retrieved 1 September 2007. ^ a b c "www.cyclingnews.com presents the 105th Paris-Roubaix". cyclingnews.com. ^ a b "52,8 Km of cobblestones: The notes" (PDF). www.letour.fr. 7 April 2008. Retrieved 8 April 2008. 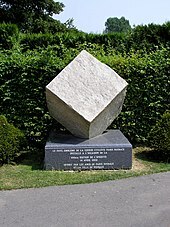 ^ "Les pavés classés de Paris-Roubaix". Radio Television Belgium RTBF. Archived from the original on 19 June 2008. ^ John Stevenson (11 April 2004). "Tales from the pavé on the road to Roubaix". Cyclingnews. ^ "Video of the inauguration of the memorial to Jean Stablinski". La Voix Des Sports. ^ Bouvet, P. Callewaert, P. Gatellier, J. Laget S. (2006), p.54-55. ^ "Dossier descriptif pavés" (PDF). Les Amis de Paris-Roubaix. Archived from the original (PDF) on 31 October 2008. ^ Gregor Brown (8 April 2008). "106th Paris-Roubaix - 1.HC, Hell's pavé strike its rhythm". Cyclingnews. ^ "Big Chainring Ride Around Lago di Garda". Italian Cycling Journal. 15 April 2007. ^ Jeff Jones (9 April 2004). "Boonen's top five". CyclingNews. Retrieved 22 April 2009. ^ Brecht Decaluwé (12 April 2008). "Boonen and Devolder lead Quick Step into hell". Cyclingnews. ^ Ben Delaney (27 June 2008). "Specialized Roubaix SL2 goes wide". VeloNews. ^ Andrew Hood (9 April 2006). "Paris-Roubaix; Fabian the giant killer". VeloNews. Archived from the original on 14 March 2009. Retrieved 27 January 2009. ^ "The bikes of Hell: After Roubaix". Cyclingnews. 14 April 2006. ^ "Special Rules". www.letour.fr. 2007. Retrieved 1 September 2007. ^ Bouvet, P. Callewaert, P. Gatellier, J. Laget S. (2006), p.100-102. ^ "37th Paris-Roubaix 1936 (France)". cyclingrevealed.com. Retrieved 25 February 2008. ^ Bouvet, P. Callewaert, P. Gatellier, J. Laget S. (2006), p.102. ^ "La faute a Macadam". ^ Charles Pelkey (11 March 2009). "The Explainer: Daily life in the peloton". VeloNews. Archived from the original on 17 May 2009. Retrieved 2009-06-18. ^ "Stephen Roche and Sean Kelly are names etched into the psyche of cycling aficionados". Irish Examiner. 31 December 1999. Archived from the original on 29 September 2007. Retrieved 2008-02-25. ^ Kelly, Sean (9 April 2014). "Sean Kelly on Paris-Roubaix, the Hell of the North". telegraph.co.uk. Retrieved 26 July 2015. ^ "Chris Horner: Back to the Big Leagues — Part Two". dailypeloton.com. 29 December 2004. Retrieved 25 February 2008. ^ Jeff Jones, Chris Henry & Gabriella Ekström (11 April 2004). "102nd Paris-Roubaix — CDM". Cyclingnews. ^ "Preview: Issue 13". Rouleur. Archived from the original on 14 June 2009. Retrieved 2009-06-23. ^ "Paris Roubaix 2008 : En Haute du Pave..." (PDF). Les Amis de Paris Roubaix. Archived from the original (PDF) on 3 July 2008. ^ "Travaux 2008" (in French). Lesamisdeparisroubaix.com. 13 November 2008. Archived from the original on 28 March 2008. Retrieved 24 March 2010. ^ a b c d e "Daily Peloton - Pro Cycling News". dailypeloton.com. Archived from the original on 20 September 2007. Retrieved 29 August 2007. ^ "Mathew Hayman". ProCyclingStats. Retrieved 10 April 2017. ^ "102nd Paris Roubaix Preview". dailypeloton.com. 9 April 2004. Archived from the original on 20 September 2007. Retrieved 1 September 2007. ^ Ben Atkins (21 June 2004). "Ben Atkins' Paris-Roubaix Cyclo". Cyclingnews. Philippe Bouvet, Pierre Callewaert, Jean-Luc Gatellier, Laget Serge: Paris–Roubaix: A Journey Through Hell (ISBN 1934030090), VeloPress, 2007. The inside story of the race, its great riders, its traditions, and its secrets. Also in German: Paris-Roubaix. Die Hölle des Nordens. Delius Klasing, Bielefeld 2011, ISBN 978-3-7688-3268-7. MacGregor, Iain (2015). To Hell on a Bike: Riding Paris-Roubaix: The Toughest Race in Cycling. Transworld Publishers. ISBN 978-1-4735-1037-1. Bouvet, Philippe; Brunel, Phillipe; Callewaert, Pierre; Gatellier, Jean-Luc; Laget, Serge (2010). The Spring Classics: Cycling's Greatest One-Day Races. Boulder, Colorado: VeloPress. ISBN 978-1-934030-60-8. Woodland, Les (2013). Paris-Roubaix, the Inside Story: All the Bumps of Cycling's Cobbled Classic. Cherokee Village, AR: McGann Publishing. ISBN 978-0-9859636-1-3. 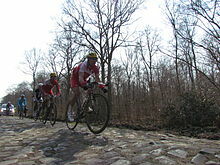 Wikimedia Commons has media related to Paris-Roubaix.